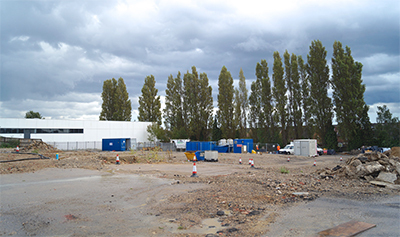 A former petrol filling station was being remediated to allow development of a supermarket. As part of the works, a pump and treat system (P&T) was installed to recover LNAPL and groundwater impacted with dissolved phase contamination. In order to increase the efficiency of the system, REGENESIS was retained to apply PetroCleanze into the subsurface via fixed injection points. PetroCleanze® was applied to the chalk aquifer, targeting a wide smear zone above and below the present groundwater level. The existing abstraction system was used to draw the application across the target area to provide the maximum coverage. PetroCleanze temporarily provides a strong desorptive effect, drive adsorbed contamination into the groundwater where it can be removed. It allows the abstraction system to remove a greater proportion of free and dissolved phase contamination from the subsurface. This has the effect of shortening the operational time of the P&T system and reduced re-bound effects due to on-going desorption from the smear zone. Reduction in adsorbed, free and dissolved phase contamination, decreasing the likelihood of rebound following switch off of the P&T system.